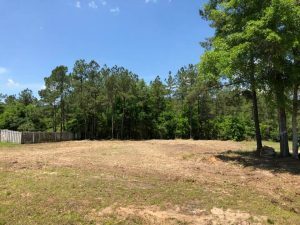 Forestry Mulching - Land Clearing - Collins Land Services, Inc.
Land clearing using forestry mulching is one of the most economical and environmentally friendly ways to surgically clear your land. 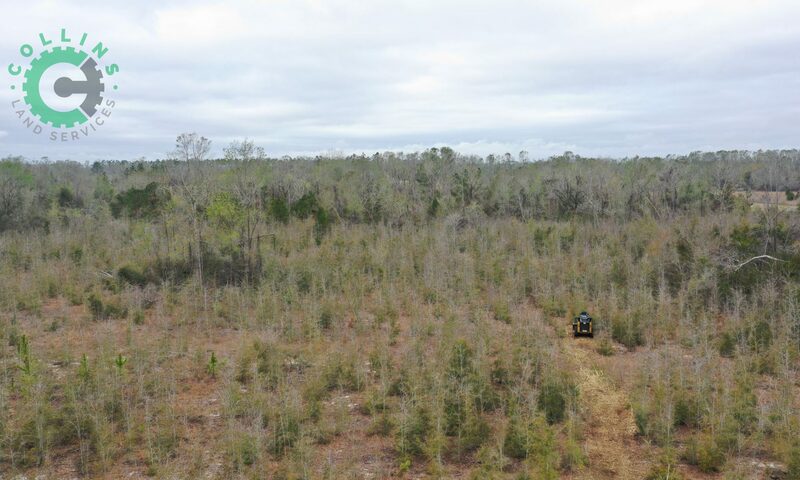 Forestry mulching is a land clearing method that uses a single machine to cut, grind, and clear vegetative growth. The units we have uses a rotary drum equipped with steel planar “teeth” to remove and shred trees, brush and heavy vegetation. 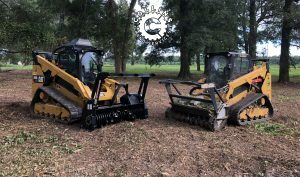 The mulch is simultaneously distributed over the cutting area, reducing erosion and vegetative regrowth while leaving a natural, forest-like environment. Forestry mulching is used for land clearing, right of way clearing and maintenance. wildfire prevention, overgrown and heavy brush management, invasive species control and wildlife conservation and restoration. We have multiple machines so we can always provide the correct equipment for your project no matter the size. For smaller projects we have the Caterpillar 259D (75hp) with an FAE DML SSL 150 head. For larger projects we have the Caterpillar 299D2 XHP (106hp) with a Dennis Cimaf 180d head. For the largest projects we have the Rayco C200 (200hp) with a Dennis Cimaf 180d head. The 259D is perfect for projects that need underbrush and trees up to 5″ in diameter cleared. It leaves an excellent finished product. 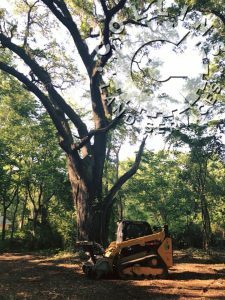 The 299D2 XHP is perfect for projects that need underbrush and trees up to 10″ diameter cleared. The finish is also excellent. 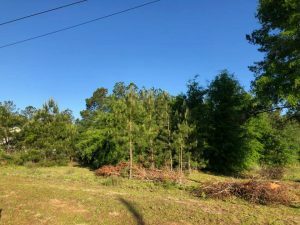 Recent Project: Client wanted this small lot cleared. We were able to complete the project in 1/2 day with the FAE Forestry Mulcher. 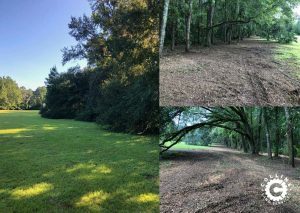 Recent Project: Our client wanted to expand his property line enhance the beauty of his live oaks. We used our 259d with FAE head to complete this job. Mulching reduces the potential for wildfires by eliminating small leafy plants, fallen or rotten trees, and other fuel sources. If left untreated, these fuel loads increase potential for fire, increase the heat intensity, and serve as fire ladders that enable fire to elevate quickly to the tops of trees which is where a fire can spread most quickly. Mulching can also be used to create a coarse grind finish that can create a more ideal controlled burn. Proactive mulching can reduce stress on trees caused by crowding, making them less susceptible to attack from invasive species. Mulching invasive species in place can control the spread of invasive plants, insects, and fungus. The mulching action tends to discharge the material downward and within a reasonably confined area, versus other methods such as rotary cutters that may laterally disperse pine beetles or other invasive species into neighboring healthy trees. Forestry mulching has become popular among nonprofit riparian conservation organizations, government agencies, hunt clubs, and private land owners in attempts to maintain habitats for pheasants, doves, elk, deer and various other animals. Maintaining an animal habitat encompasses several different aspects: food, water, shelter, and space, and there are many products that can help reclaim and maintain wildlife habitats for these animals.Food: Forestry mulchers are often used for removing underbrush and invasive species, such as buckthorn and multiflora rose, in order to allow the rejuvenation of grasses and other food sources. Water: Forestry mulchers can be used to restore water source access that has been blocked due to tree and understory growth, allowing animals to access the water. Or tell us a little about your project and we will contact you.